Cumann na Daoine, Catherine Street, Youghal, Co. Cork, Ireland. 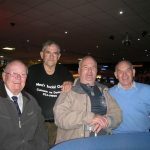 The Men’s Social Club has been in existence for over 11 years. It was established to provide a space for men of all ages, and social groups to meet in a friendly and understanding atmosphere. to promote the development of men in a society where men fail to reach their potential. 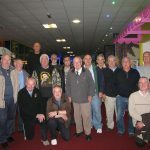 Our Shed is open to men from all walks of life, as a group we undertake a variety of social activities, such as Fishing, 10 pin bowling, Chess classes, Computer classes, Craft, Pottery and Art classes, with tutors on hand to give expert advice. We go on visits to centres of national interest and network with similar groups to ourselves. Our drop in centre in Cumann na Daoine is known as the Den, and is open most mornings from 10.30 to 1.00pm, why not drop in for a cup of tea / coffee or a chat? We hold our group meetings in Cumann na Daoine every Thursday morning at 11.00am for approximately hour and a half. The topics discussed are at the discretion of members and forward planning is agreed on by the committee Usually a guest speaker, if possible every three months, is invited to attend. On Fridays we hold our Indoor Green Bowls from 2pm to 4pm in Cumann na Daoine which is open to men and women. The group took a trip from Youghal to Cappoquin by boat up the Blackwater. 12 members went and had a picnic up the river. We are always on the lookout for new members so why not come along or encourage someone else to join. LGBT+ Network Cafe: this weekend! Successful East Cork Recruitment & Upskilling Fair!